We offer bespoke events tailored to your group, business or organisation’s requirements in a beautiful rural environment. Stunning venue: Our peaceful 26 acre nature reserve, managed for Barn Owls – the Lennon Legacy Project – is right on the edge of wild Dartmoor. Our lovely Meeting Room is a purpose built, wood-lined room able to comfortably accommodate up to 30 people. Take your time: Events can be designed to run for a few hours or a few days, depending on your timescale and the season. 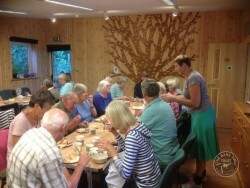 Enjoy refreshments including delicious lunches, home-made cakes and yummy Devon cream teas. Vegetarian or other dietary options can be provided as required. Please contact us with your details to find out how we can provide your group with a unique and memorable experience. 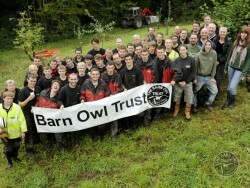 Feel good… help Barn Owl conservation, learn, enjoy, work and play together! About the LLP – ‘Barn Owl Heaven’ – The Lennon Legacy Project is a wild-life haven managed for Barn Owls near the small town of Ashburton on the edge of Dartmoor, Devon UK. 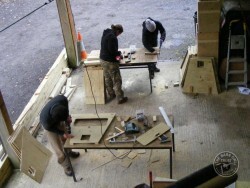 Volunteer to help Barn Owls – There are lots of ways you can get involved! Barn Owl Trust Events Diary – Dates for local Barn Owl talks, walks, workshops, practical conservation and more!